Dairy free almond flour low carb pizza dough perfected!! 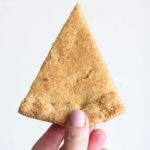 This is the perfect keto crusts recipe to top with your favorite ingredients. Mix almond flour, baking powder, salt and psyllium husk together in a large bowl. Pour apple cider vinegar and boiling water over the dry ingredients. Stir to combine and knead the dough into a ball. Set the dough aside for a 5 minutes, allowing the psyllium husk to absorb the liquids. Prepare a sheet of parchment paper, and place the dough on top. With slightly damp hands, press the dough into a 10” circle. Fold the edges of the dough over to form a crust. Prick the dough with a fork to stop it from bubbling. Brush olive oil over the edges of the crust so they don’t burn. If you’d like to pre-bake the crust without toppings, brush olive oil over the entire pizza. Fill you dough with desired toppings and bake in the oven for 18-22 minutes, or until your toppings are golden brown and the dough is cooked through. Enjoy! Nutritional information is based on 1 slice, if you cut your dough into 8 slices. It doesn’t include any toppings, pizza crust only.